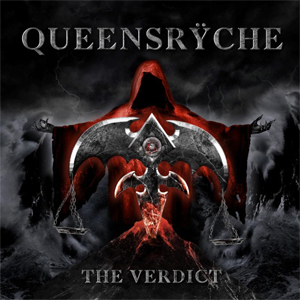 The Verdict is album number three with lead vocalist Todd La Torre, and album number 15 overall for QUEENSRŸCHE. So, what’s “the verdict?” The cryptic album cover features the Tri-Ryche as a scale, cracking and tilting slightly to one side. But which side? QUEENSRŸCHE is a band in flux over the past few years, with the change at singer, then the change at drummer. The only constant is change, and this is reflected in these songs. Drummer and founding member Scott Rockenfield took time away from the band a few years ago, and apparently has decided not to come back. In his place is former KAMELOT drummer Casey Grillo, a formidable force behind the drumkit. In the studio, however, QUEENSRŸCHE is a four-piece. The Verdict is the first material QUEENSRŸCHE has ever recorded without Scott on drums. The MVP award definitely goes to Todd La Torre, who played all the drums on The Verdict. He was the second musician to sing for QUEENSRŸCHE, and is now the second to play drums as well. To be fair, Todd is a very skilled drummer and his playing fits these songs perfectly. Founding members Eddie Jackson (bass), and Michael Wilton (guitar) join longtime guitarist Parker Lundgren to complete the lineup. The first three songs on The Verdict are some of the strongest the band has recorded under Todd’s tenure as vocalist. These are the first songs the band performed on The Verdict tour, which is going on right now. Immediately, “Blood of The Levant” is a killer power metal track, with an equally impressive video. You can view it on KNAC.COM HERE. This is a convincing song played with menace; the topic revolves around people of middle-eastern descent and their quest for being understood. There is even a line spoken in Arabic to get the point across. Stellar vocals/drums from La Torre add to the success of this track. Lead-off single “Man The Machine” rocks along at a steady pace and is a successful composition for sure, with plenty of standout guitar work from Lundgren and Wilton, and a passionate vocal from La Torre. Eddie Jackson earns his keep by contributing the incredibly cool “Light-Years”, featuring a great hook in the chorus and a slick bass line, and the up-tempo “Propaganda Fashion”, another essential track on The Verdict that the band have recently worked into their live set. Guitarist Parker Lundgren contributes a standout track, the powerful and haunting “Dark Reverie”, a song about a bleak daydream. Producer Chris ‘Zeuss’ Harris adds some keyboards here as well. “Bent” is a solid song, and touches on some recent socio-political topics. One of the most intriguing songs on the album is “Launder The Conscience”, a track composed mainly of a single verse and chorus, yet these are put to great use, and the track features a nifty extended outro. No epics are found on The Verdict; these songs are all in the succinct three to five minute range and don’t overstay their welcome. The whole album is around the 44-minute mark. So what is the verdict on The Verdict? I think this album is a success on many levels: songwriting, performance and production. I’m impressed with the songs and the overall way The Verdict sounds. Zeuss’ work with heavy acts such as OVERKILL and ICED EARTH is a benefit to the robust way The Verdict sounds. I’m impressed a band that has released 15 studio albums and been around for over 36 years is still releasing quality material like this. Century Media is releasing the album in a variety of formats, including digipak, box set, as well as red smoke and clear smoke vinyl. Check this album out if you like what you hear.